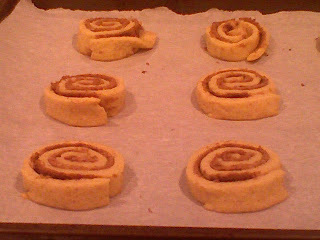 I rarely make icebox cookies (which require chilling) since I don't have the patience to wait for it - but I was home for spring break last week so I thought I'd give these cinnamon swirl cookies a shot. Pretty, aren't they. The recipe for these came TheBakingPan.com, a site I've never tried before but they looked pretty good, and not too difficult. And they weren't. Overall they were ok, perhaps a little on the dry side, but the filling was fun and they looked really pretty. The recipe called for a vanilla icing to be drizzled on top to complete the faux cinnamon bun look, but I opted out, assuming quite correctly that they would be sweet enough without. So anyway, the recipe was a basic cookie dough that I refrigerated for a couple hours. 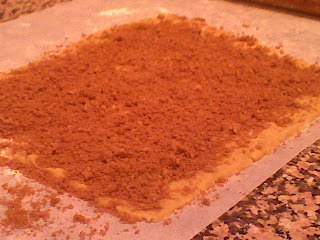 Then I rolled it out and sprinkled the dough with a brown sugar and cinnamon mix, and pressed it into the dough. Then the dough gets rolled up in wax paper and refrigerated in a log for a couple more hours. I stuck it in the freezer for those, and I put it in for even longer than called for because it really needs to firm up here. 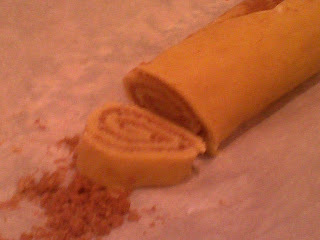 After a while I removed the log and sliced up the cookies, maintaining as much of the filling as I could. I also lost both ends of the log, but don't worry, it didn't quite go to waste! I laid out the cookies on a prepared baking sheet, stuck em in the oven, and voila! 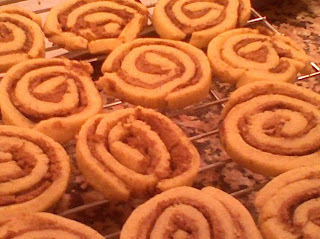 Cinnamon Swirl Cookies. Luckily only a few of them fell apart - you can see the top left one here didn't quite stick together. Tip of the Day: When working with icebox or rolled out cookies, always stick whatever dough you're not currently using back in the fridge or freezer for later use. Add in the eggs and vanilla, and beat until combined. Add in the flour, baking powder, salt and cinnamon. Refrigerate the dough for at least 2 hours. Mix together the brown sugar and cinnamon in a bowl. Roll the dough into a 1/4 inch thick rectangle, and sprinkle with the filling. Tightly roll up the dough and wrap in wax paper, refrigerate at least four hours, or overnight. Slice the cookies 1/4 inch thick and bake at 350 F for 9 minutes. #1 reason you shouldn't read blogs while you are at work: you will want the cookie and cannot have it. Fate of the Cookie Dough - Part 2: Lemon Bars!